Last week I made some Okinawa-style short ribs. 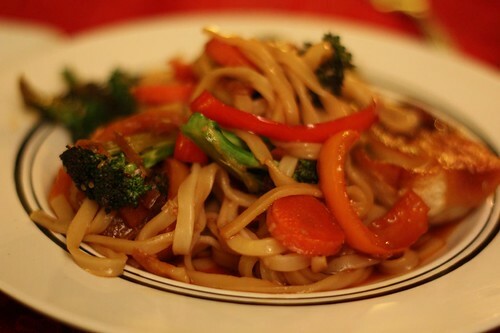 This week I'm trying to keep things a little lighter and more vegetarian. That is, except for the lamb and scallops last night. 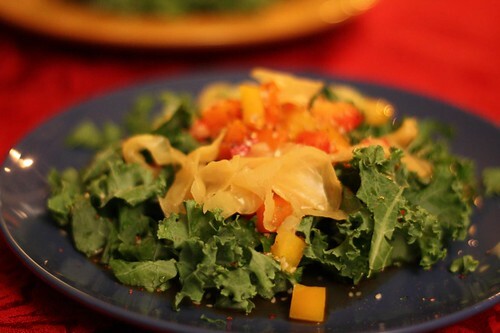 I started off my making this Okinawa-style pepper and kale salad. Okay, I say it's Okinawa-style but only because I want to pair it with the main dish tonight. I have no idea what they make in Okinawa. I don't even know if they have peppers in Okinawa. I guess they probably do. 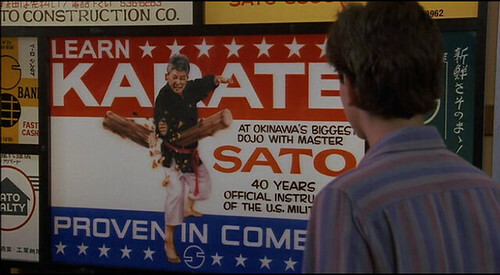 The only thing I know about Okinawa is that we fought some battles there in World War II. Oh, and that Sato lives there and he can split a tree in half with his bare hands! I had a good amount of broth leftover from the short ribs and I thought that it would make a fantastic sauce for vegetables with some noodles. It turns out I was right! I seared some halved baby bok choy with a little sesame oil then added sliced carrots; red, yellow, and orange bell peppers; and broccoli. After it was lightly cooked I topped it off with the leftover maple-soy broth from the short ribs and some cooked Japanese noodles. 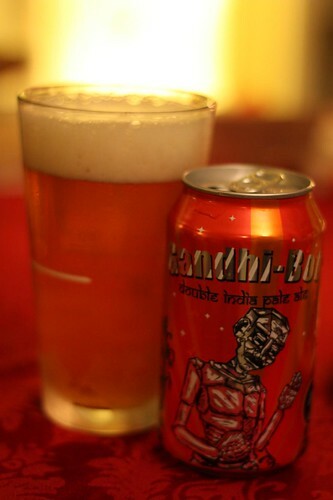 I didn't really have a thematically or ethnically appropriate beer so I cracked open this Gandhi-Bot from New England Brewing Co. Generally IPAs are my least favorite type of beer. The bitterness is usually something I don't go for. However, the sight of the Gandhi robot on the can was enough to look past all that. It could have been a can of poo called Gandhi-Bot and I would have bought it. Even with my dislike of IPAs I enjoyed this beer (again, see the can). I think Gandhi would have appreciated my vegetarian take on tonight's dinner. That's going to be my official attempt to tie in the beer to the meal tonight. I'll leave it at that. No need to tell Gandhi about the beef that had been cooked in the broth. It would only upset him and then he'd be forced to fry us with his death ray eyes! Surf and Turf . . . and LOVE!